Diversity’s role in the workplace maintains a far higher priority among Millennials than older generations, and members of this demographic place a premium on this factor when searching for prospective jobs, according to a December report issued by Weber Shandwick and the Institute for Public Relations. Millennials now comprise more than a third of all employed Americans, and this year surpassed GenXers as the most represented demographic in the U.S. workforce, according to a recent Pew Research Center analysis of U.S. Census Bureau data. Nearly half — 47 percent — of this generation said they consider diversity and inclusion to be an important criterion when considering potential employers, significantly higher than Gen X (33 percent) and Baby Boomer (37 percent) job seekers. The study also found that far more Millennials (64 percent) claimed they were comfortable discussing issues related to workplace diversity and inclusion than members of the Gen X (57 percent) and Baby Boomer (54 percent) generations. When it comes to the prevailing reasons why workplace diversity was important, all three generations listed diversity’s role in making a workplace a generally better environment among their top reasons. Millennials and GenXers also widely claimed that diversity increases opportunities for all employees. However, GenXers and Boomers also listed outside pressure and a need to improve a company’s reputation as important reasons for workplace diversity. Millennials, on the other hand, also cited the notion that diversity improves employee morale. Research also found that nearly six out of every 10 U.S. employees (58 percent) have witnessed some form of discrimination or bias occur in the workplace. According to the study, the most common of these incidents involved racial or ethnic discrimination, followed by gender discrimination and age discrimination. The study suggests Millennials are significantly more likely to be attuned to these behaviors, as this demographic statistically reported far higher occurrences of discriminatory incidents than older generations. Incidents of racial discrimination, for example, was noticed by 27 percent of Millennials, versus 21 percent of GenXers and 14 percent of Baby Boomers. 23 percent of Millennial respondents said they’ve witnessed gender discrimination in the workplace, versus 16 percent of GenXers and 13 percent of Baby Boomers. 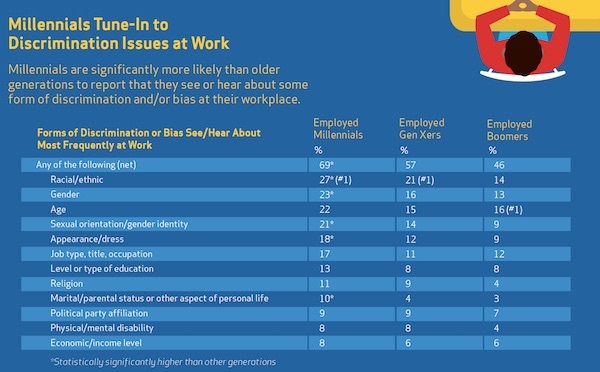 22 percent of Millennials polled said they’ve seen age discrimination in their place of employment, versus 15 percent of GenXers and 16 percent of Baby Boomers. The study also found that fewer than half of all U.S. employees — 44 percent — believe their employer is doing a good job communicating workplace diversity and inclusion goals. On the other hand, about a third of all respondents — 34 percent — said they actually experience more diversity at their jobs than in their personal lives. Interestingly enough, Millennials were more likely to agree with this statement — 36 percent — suggesting a greater disparity exists among this generation when it comes to the values they’re exposed to at work in contrast to what they experience elsewhere. Moreover, a wider margin of employed Millennials — 53 percent — said they considered their workplace to be “very diverse,” compared to only 46 percent of GenXers and 54 percent of Baby Boomers. Research for the Weber Shandwick/IPR survey was conducted by KRC Research, and consisted of online interviews with more than 1,000 U.S. adults.